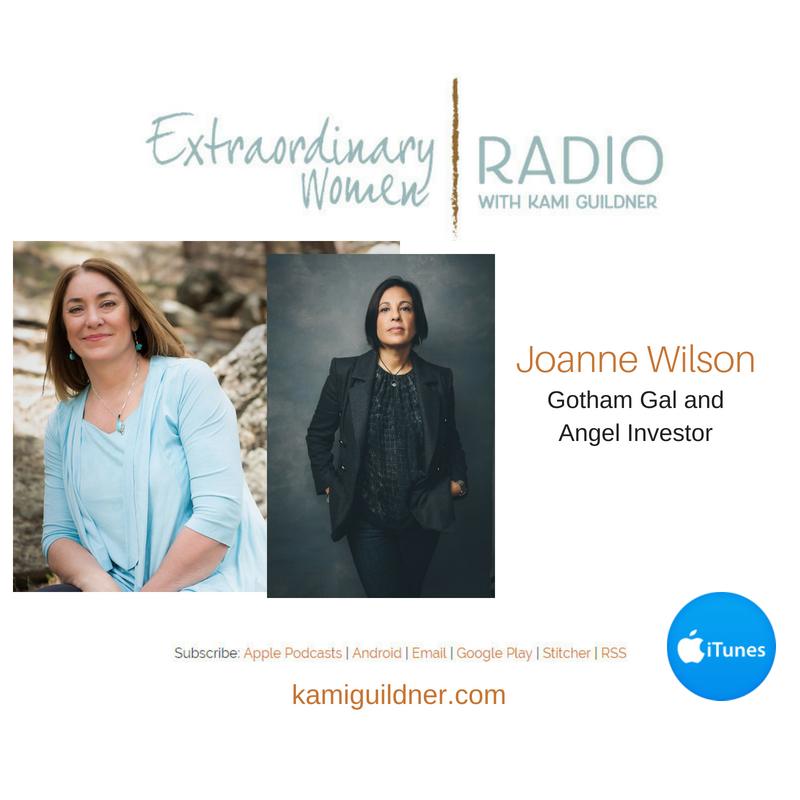 Today’s Extraordinary Women Radio guest is Gotham Gal and angel investor, Joanne Wilson. Joanne has a portfolio of over 90 companies, such as Lately (you might remember my episode a few months ago with founder Kate Bradley Chernis), Food52, Sweeten, Vengo, Nestio, Flip, Clutter, and Union Station. Joanne has had many careers before she found her way into angel investment, and she shares some of her reinvention stories in our interview today. She believes that necessity is not only the mother of invention but also of constant reinvention because as an individual, a company, or brand, you have to be able to think ahead to stay ahead of the curve. Sometimes, what you think of as a misfortune, like losing a job, is actually a blessing in disguise. Joanne co-founded the Women’s Entrepreneur Festival in 2011 which is a conference for a community of women entrepreneurs. While the Festival was put on hold for a few years, she’s currently working with Brazen to bring it back in 2019. At the end of the day, what she hopes for women is equality in consideration of your unique multi-layered dimensions. She has maintained her very popular blog, gothamgal.com for over 13 years and has recently taken her talents to the airwaves on her podcast, Positively Gotham Gal, as another medium for having profound conversations with women. And if there are three pearls of wisdom she wants to impart to women, it would be self-awareness, trusting your gut, and following your heart. I’m thrilled to introduce you to Gotham Gal – Joanne Wilson!